BATHROOM CLOAKROOM COUNTERTOP TEMPERED GLASS BASIN SINK. This high quality modern design countertop basin creates functional art for the bathroom. Bathroom Sink. Kitchen Sink. Tap and mixer. They would add this contemporary charm to any size bathroom that had any style. Tempered glass wash basin matching with brass waterfall mixer faucet tap Thicker basin, wear and collision Smooth edge angle, to prevent accidents High temperature firing, no cracks, no water seepage Exquisite workmanship. Easy to install and clean Can be cleaned with mild soap to ensure the non-tarnish life shine Our packaging can guarantee the safety of products to reach your hands, the use will not cause any harm. If the product has any damage, please take pictures to contact us. The appearance of exquisite to improve the taste of life Feature: Sleek European inspired modern contemporary Art design Luxury oversized creation Premium quality tempered glass construction Above the counter installation Package included: Tempered Glass Sink x1 Tap x 1 Pop Drain x 1 All Installation Accessor. Tempered glass wash basin matching with brass waterfall mixer faucet tap Thicker basin, wear and collision Smooth edge angle, to prevent accidents High temperature firing, no cracks, no water seepage Exquisite workmanship. Easy to install and clean Can be cleaned with mild soap to ensure the non-tarnish life shine Our packaging can guarantee the safety of products to reach your hands, the use will not cause any harm. If the product has any damage, please take pictures to contact us. The appearance of exquisite to improve the taste of life Feature: Sleek European inspired modern contemporary Art design Luxury oversized creation Premium quality tempered glass construction Above the counter installation Package included: Tempered Glass Sink x1 Tap x 1 Pop Drain x 1 All Installation Access. Basin Shape:Round. Material: Tempered glass. Premium quality tempered glass construction. Glass sink. Processing:Hand Painted. if you need more Model. If item is defective after 2 months, you can still send it back to us. Details: Type:Countertop Sinks Material: Tempered glass Special Application: Handwash/Shampoo sinks Basin Shape:oval Processing:Hand Painted Faucet material: Brass Faucet finish: Chrome Valve Type: Ceramic Valve Hot and Cold: Yes Waterflow Way: Watefall Water Pressure: 0.1-0.7Mpa Features: Sleek European inspired modern contemporary Art design Luxury oversized creation Premium quality tempered glass construction Above the counter installation What's Included: Glass sink Faucet Chrome Pop-Up Drain Installation accessories. Details: Type:Countertop Sinks Material: Tempered glass Special Application: Handwash/Shampoo sinks Basin Shape:Oval Processing:Hand Painted Faucet material: Brass Faucet finish: Chrome Valve Type: Ceramic Valve Hot and Cold: Yes Waterflow Way: Watefall Features: Sleek European inspired modern contemporary Art design Luxury oversized creation Premium quality tempered glass construction Above the counter installation if you need more Model .welcome to my store. What's Included: Glass sink Faucet Chrome Pop-Up Drain Installation accessories. 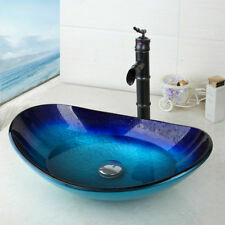 LUXURY Blue Glass basin. 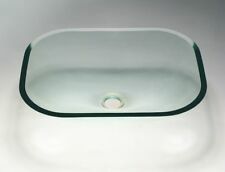 Tempered and durable glass basin. Colour:Blue marble textured painted. hand painted marble texture. TAP £30 (not the tap in the pic). Pop up waste £10. bottle trap £20. Add a bit a class to your bathroom at a price that is affordable. 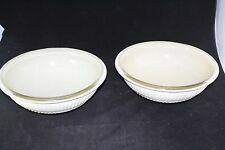 Unique Exclusive Italian GOLD Oro Counter Top Drop-In Glass Washbasin Bowl 30cm. Depth / Height. Don't Miss Out. "Part ART part HEART". Tempered glass wash basin matching with brass waterfall mixer faucet tap Thicker basin, wear and collision Smooth edge angle, to prevent accidents High temperature firing, no cracks, no water seepage Exquisite workmanship. Easy to install and clean Can be cleaned with mild soap to ensure the non-tarnish life shine Our packaging can guarantee the safety of products to reach your hands, the use will not cause any harm. If the product has any damage, please take pictures to contact us. The appearance of exquisite to improve the taste of life Sleek European inspired modern contemporary Art design Luxury oversized creation Premium quality tempered glass construction Above the counter installation. Details: Type:Countertop Sinks Material: Tempered glass Special Application: Handwash/Shampoo sinks Basin Shape:Round Processing:Hand Painted Faucet material: Brass Faucet finish: Chrome Valve Type: Ceramic Valve Hot and Cold: Yes Waterflow Way: Watefall Features: Sleek European inspired modern contemporary Art design Luxury oversized creation Premium quality tempered glass construction Above the counter installation if you need more Model .welcome to my store. What's Included: Glass sink Faucet Chrome Pop-Up Drain Installation accessories. 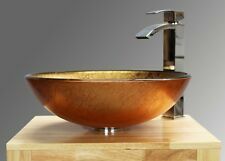 BROWN/GREEN RUSTIC tempered glass basin with Matching Waterfall Tap Mixer. 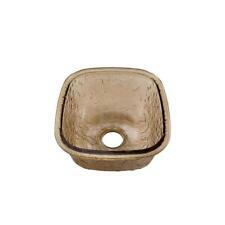 RUSTIC BROWN GREEN GLASS BASIN SINK. 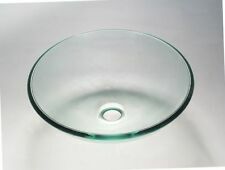 Tempered and durable glass basin. Colour: rusted green / brown GLASS. Pop up waste for £10. 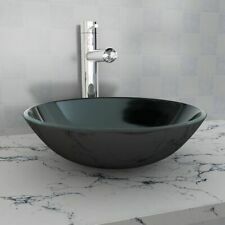 Oval tempered glass wash basin matching with ORB brass waterfall mixer faucet. Modern style,Luxurious design. Thicker basin, wear and collision. Smooth edge angle, to prevent accidents. Faucet Total height: 265mm (10.6 "). Specification: Sink Material: Tempered glass Faucet Material: Brass & Glass Pop Up Drain Material: Stainless Steel Overflow: No Installation Type: Above the counter Sink Shape: Round Finish: Hand Painting Main Color: Blue Feature: Sleek European inspired modern contemporary Art design Luxury oversized creation Premium quality tempered glass construction Above the counter installation Package Include: Glass Sink Brass Faucet Chrome Pop-Up Drain All installation accessories Notice: all the painting are hand made, so there might be a little bit difference of the painting lines between two pieces. 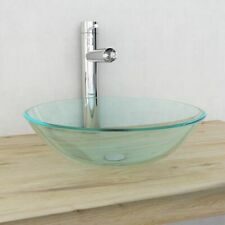 Exclusive Italian SILVER Argento Counter Top Drop-In Glass Washbasin Bowl 30 cm. Depth / Height. Don't Miss Out. The Purple Panther. "Part ART part HEART". BLUE GLASS BASIN. DESIGNER GORGEOUS BLUE GLASS BASIN. 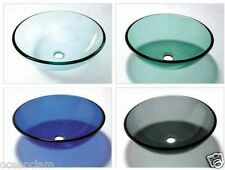 Tempered and durable glass basin. A tap for £30. Add a bit a class to your bathroom at a price that is affordable. Colour:Clear BLUE Glass. Bottle trap £20. Tempered glass wash basin matching with brass waterfall mixer faucet tap Thicker basin, wear and collision Smooth edge angle, to prevent accidents High temperature firing, no cracks, no water seepage Exquisite workmanship. Easy to install and clean Can be cleaned with mild soap to ensure the non-tarnish life shine Our packaging can guarantee the safety of products to reach your hands, the use will not cause any harm. If the product has any damage, please take pictures to contact us. The appearance of exquisite to improve the taste of life Feature: Sleek European inspired modern contemporary Art design Luxury oversized creation Premium quality tempered glass construction Above the counter installation Package included: Tempered Glass Sink x1 Tap x 1 Pop Drain. Fantastic quality solid hardwood washstand with tempered frosted glass top and bowl. BASIN WATERFALL TAP POP UP WASTE. Luxury clear tempered glass basin with Matching Waterfall Tap Mixer. 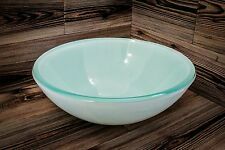 Tempered and durable glass basin. WITH POP UP WASTE. Add a bit a class to your bathroom at a price that is affordable. NEW JSG Oceana Glass Undermount Kitchen Sink 14-1/2" x 14-1/2" x 4-1/2"